Scientists for 9/11 Truth and the International Center for 9/11 Studies will be sponsoring a “Conference on the 9/11 Pentagon Evidence” on May 4 in Denver, Colorado. To date we have three co-sponsors: Northern California 9/11 Truth Alliance, 911Truth.org, and Michael Wolsey of visibility911.org. Other groups are invited to co-sponsor this event. The goals of this conference are to present current evidence that any viable theory must address and to put the discussion of what happened at the Pentagon on a solid scientific footing to make our movement as strong as possible. If the Truth Movement ever gets real traction in a court of law or with society at large, we will be attacked at our weakest point. Our adversaries are very powerful and have the media at their beck and call. If we are shown to be in disarray on such a major issue as the Pentagon, our good work proving demolition at the World Trade Center might well be ignored. Thus we welcome your participation in this conference and your questions as we continue in the search for truth. The invited speakers at this event are, in alphabetical order, David Chandler, Wayne Coste, Ken Jenkins, Warren Stutt, and John D. Wyndham, all of whom have done active scientific research on the evidence at the Pentagon. We invite you to join us in Denver on May 4 and/or help us defray the costs by contributing financially through our GoFundMe account. The event will be videotaped. We invite 9/11 Truth organizations and individuals to co-sponsor this event. Sponsorship does not imply endorsement of the particular conclusions of the various presenters, but implies support for the goals and process that are being advocated. Let us know if you or your group would like to be listed as a co-sponsor. Filed Under: 9-11 Cover-Up, 9-11 Truth Movement, Citizens Investigation, David Chandler, Events & Actions, Evidence, Flight 77, Pentagon, Pentagon Attack, Scientific Method, V for Visibility, What Hit the Pentagon? 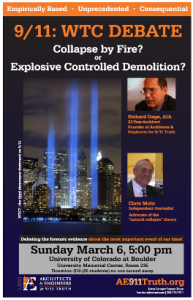 (Audio) 9/11 WTC Debate: Collapse by fire or explosive controlled demolition? матраци On Sunday afternoon, March 6th, at the Boulder campus of the University of Colorado, Colorado 9/11 Visibility hosted a debate between Richard Gage, AIA (American Institute of Architects), and Chris Mohr, Denver investigative journalist and nondenominational minister. This is the audo of that historic debate. The question: What brought down the three World Trade Center skyscrapers? 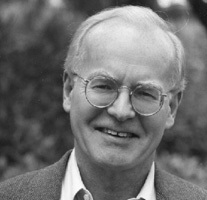 Richard Gage, AIA, is a San Francisco Bay Area architect and a member of the American Institute of Architects. He has been an architect for over 23 years and has worked on most types of building construction, including numerous fire-proofed, steel-framed buildings. His quest for the truth about 9/11 began in 2006, and he subsequently founded Architects and Engineers for 9/11 Truth. Chris Mohr, investigative journalist and advocate of the “natural collapse” theory, is a sincere seeker of the truth who has extensively researched the collapses of the World Trade Center (WTC) buildings, consulted with independent physicists and engineers, and passionately argues that the buildings collapsed due to the plane impacts and fires. In November 2010 at Denver’s Mercury Café, Mohr debated attorney Earl Staelin on the collapse of the twin towers. This debate was unprecedented in its civility and professionalism. During this debate between Chris Mohr and Richard Gage, the discussion explored not only the collapse of the twin towers, but also that of 47-story World Trade Center Building 7, which collapsed completely at 5:21 pm on 9/11/01. For those of you not familiar with the collapse of WTC7, this is a riveting, don’t-miss controversy. We look forward to a dynamic, respectful, and thoroughly informative exploration of these topics. Special thanks to Colorado 9-11 Visibility and all the volunteers and donors that made this event possible. To listen to the debate, click Play in the embedded player below. Click download if you would like to download the file for your media player or iPod. DENVER, March 4, 2011 /PRNewswire/ — Colorado citizens are among the nation’s leaders in pursuing the growing questions of what really happened on September 11, 2001. At 5:00 PM, Richard Gage, AIA, a 23-year architect and founder of Architects and Engineers for 9/11 Truth, squares off with Chris Mohr, a Denver investigative journalist. See http://colorado911visibility.org/ for event details. Colorado citizens, some of whom are signatories to the Architects and Engineers for 9/11 Truth Petition (http://www.ae911truth.org) which calls for a new forensic investigation into the events of September 11th, raised the issue for adoption at their respective precinct caucuses and county assemblies. The state platform committee then discussed, finalized and voted on the resolution and forwarded it, along with many other proposed positions, for adoption by the state party. Hundreds of high-level military and intelligence officers, government officials, pilots and aviation professionals, scientists, journalists, 9/11 survivors and family members have called for a new independent investigation of the events surrounding 9/11. Their collected statements at Patriots Question 911 (http://www.patriotsquestion911.com) give weight and credibility to the call for a new, independent investigation. 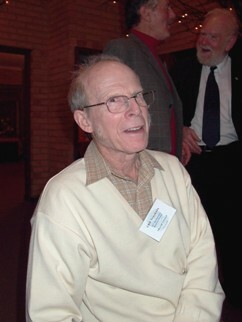 Beginning with his book New Pearl Harbor (2004) David Ray Griffin raised questions concerning the veracity of reports of phone calls from the 9/11 hijacked airliners, specifically, Ted Olson’s account. Since at least 2006, he has promoted a theory that the 9/11 plane passenger phone calls were faked, and has speculated this was done with ‘voice-morphing’ technology. He’s done this in many different articles, in books, in speaking appearances, in interviews on radio and television, and in a debate with Matt Taibbi of Rolling Stone magazine. In his 1/12/10 essay, Phone Calls from the 9/11 Airliners: Response to Questions Evoked by My Fifth Estate Interview, David Ray Griffin gives the most comprehensive overview of this theory to date, as well as a response to critics, which include people who support a new 9/11 investigation. A Professor Emeritus and skilled rhetorician, Griffin makes a case that is seemingly compelling. However, as I show in this essay, there is no actual evidence the phone calls were faked, while there is a substantial body of evidence demonstrating the calls were not only possible, but did happen. There are many credible reasons to doubt the official 9/11 story and support a full investigation, but the cause of compelling a new 9/11 investigation is undermined by the promotion of theories that are flawed, and not based on hard evidence. In addition, the claim that the phone calls were faked is obviously offensive to those family members who spoke with passengers before they died, and it has the potential to drive a wedge between truth and justice activists and potential allies among the family members, many of whom support a full investigation. I made a big point of not developing such a theory, and even encouraging members of the movement not to do this … No, you don’t have to have a theory. When you develop a theory, that’s what the debunkers love, they want to say, that’s nonsense and take attention away from all the evidence we have marshaled to show the official story is false. Certainly, ‘debunker’ websites such as 9/11 Myths have easily exposed flaws in the voice morphing theory: For instance, though the technology existed at the time, the inventor, George Papcun, has commented that voice-morphing a conversation in near real time would be more complex than fabricating a simple recorded statement, and would require an extensive recording as a sample. It would be even more difficult to fool the subject’s family members, who, in addition to being familiar with the person’s voice, would be familiar with their unique communication style and intimate details of their lives. One victim, Linda Gronlund, even left the combination to her safe on her sister’s voice mail. None of the family members who spoke with the passengers, or heard the messages they left, had any doubts it was their loved ones who called. Finally, some of those who made calls hadn’t booked their flights until the day before 9/11, meaning it would have been extremely difficult, if not impossible, to get an adequate voice sample, even assuming the perpetrators could tap anyone’s phone at anytime: Jeremy Glick, Mark Bingham, Honor Elizabeth Wainio and possibly Ed Felt. Some, including Griffin in previous essays, have suggested that Mark Bingham’s use of his full name when speaking to his mother is suspicious. First, it would be very unlikely that persons faking phone calls would introduce an element that would be a red flag to their family and outside observers. Second, Bingham’s mother (who has a different last name: Hoglan) has said that he did this on occasion; is it realistic to think voice-morphing perps learned this idiosyncrasy at the last minute and exploited it, let alone base accusations on it? In this podcast, Dr Frank Legge discusses his new paper which was co-authored with Warren Stutt and has been published at the The Journal of 9/11 Studies, titled Flight AA77 on 9/11: New FDR Analysis Supports the Official Flight Path Leading to Impact with the Pentagon (http://www.journalof911studies.com/volume/2010/Calibration%20of%20altimeter_92.pdf ). In this lengthy and detailed discussion, Dr Legge is careful to lay out his way of thinking on the Pentagon issue and why it is so important to the 9/11 Truth Movement to not make unsupported claims about the events there. Legge looks at this issue from a purely scientific perspective and is only interested in what he can prove to be true based on hard evidence. It is clear to Legge and to the vast majority of scientists who have studied the issue, that while the Pentagon is a mystery to a degree, it is most likely that AA Flight 77, a Boeing 757-200 did hit the building based on the physical evidence available. We now have the correctly decoded digital flight data from Flight 77 and it’s time for more people to get behind the call to reason on the Pentagon issue leading up to the tenth anniversary of the 9/11 Attacks! There is nothing wrong with supporting the parts of the “official story” of 9/11 that are most likely true. The team at Visibility 9-11 believe, as does Dr legge that it actually helps the interested public and especially the scientific community to see us as reasoned and balanced truth advocates when we do exactly that. Lets stop being what we are labeled as “conspiracy theorist’s” and become “conspiracy factulist’s”! 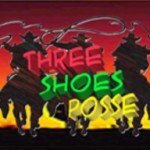 Music by Root1, also known as Three Shoes Posse. (video) The 9/11 Commission Report One Year Later, A Citizens’ Response: Did the Commission Get it Right? This is the video documentation of this historic event in FOUR parts. Speakers included Congresswoman Cynthia McKinney, victim family members Lorie Van Auken and Mindy Kleinberg, John Judge, Paul Thompson, Nafeez Ahmed, Mel Goodman, John Newman, Marilyn Rosenthal, Peter Dale Scott, Michael Ruppert, Ray McGovern, among others. We regret to say that we have not preserved the very beginning of these events which includes an introduction by Congresswoman McKinney and the beginning of Lorie Van Auken’s speech. Fortunately, we have a written transcript which can be found here. Video from the historic broadcast of Loose Change: 9-11 An American Coup on Colorado Public Television Channel 12 on December 4, 2010. Featured in-studio guest is 9-11 whistleblower Kevin Ryan and members of Colorado 9-11 Visibility manning the phones.